Presiding Officer, Legislator Norma L. Gonsalves (R-East Meadow, LD 13) attended Boy Scout Troop 507’s Eagle Court of Honor for Joseph Kim which was held at The Chamsarang Korean Methodist Church in Hempstead. Joseph undertook a project to form a non-profit organization to educate the public about mosquito transmitted Malaria in Africa. He was able to obtain corporate donations to purchase mosquito nets for an orphanage in Kenya where he volunteered and served as an educator as part of his project. 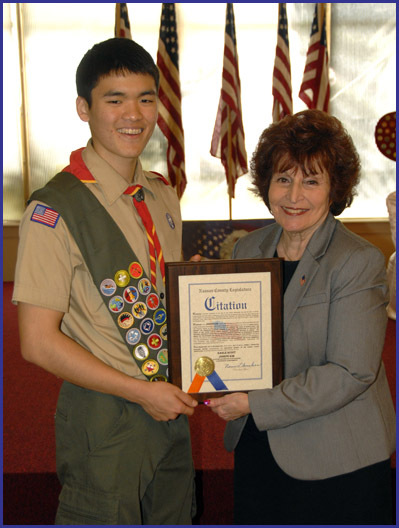 Pictured (l-r): Eagle Scout Joseph Kim and Presiding Officer Norma Gonsalves.